Do you want to treat or prevent skin aging symptoms? Or do you have other skin problems you want to address? Laser facial rejuvenation can treat a myriad of skin issues and is also a great preventative. But before getting treated, you should understand the facial laser facts. Laser facial rejuvenation is likely more potent than your at-home skincare routine. Lasers can do so much work and can dramatically change your skin. But facial lasers can improve your skin and accomplish your skincare goals. Are you ready to go on the path of beautiful skin? Here's everything you need to know about the facial laser. Laser facial resurfacing uses red light therapy as its core treatment. Red light is emitted from the sun and is the last light in the visible light spectrum. Rather than consisting of harmful UV rays, red light is beneficial. This makes laser skin rejuvenation ideal for all skin types and colors. But you should always discuss any skin issues with a doctor, such as pigmentation or sensitivity, that could interfere with the procedure. One of the secrets of laser skin rejuvenation is it increases collagen production. Collagen is made naturally and helps keep your skin plump and wrinkle-free. As you age, your body doesn't produce as much collagen. This is when wrinkles form. Lack of collagen also occurs when your skin scars, such as an acne scar. But rather than layering skincare products on your face to add the collagen your skin is losing, laser therapy will incite your natural collagen production. This will help reduce the wrinkles you have and will prevent new ones from forming. Your skin will also be tighter, preventing any sagging. This will also benefit younger patients who want to prevent aging symptoms and will also treat scars such as acne scars. The laser can lift any drooping skin from the eyebrows, jawline, and eyelids. 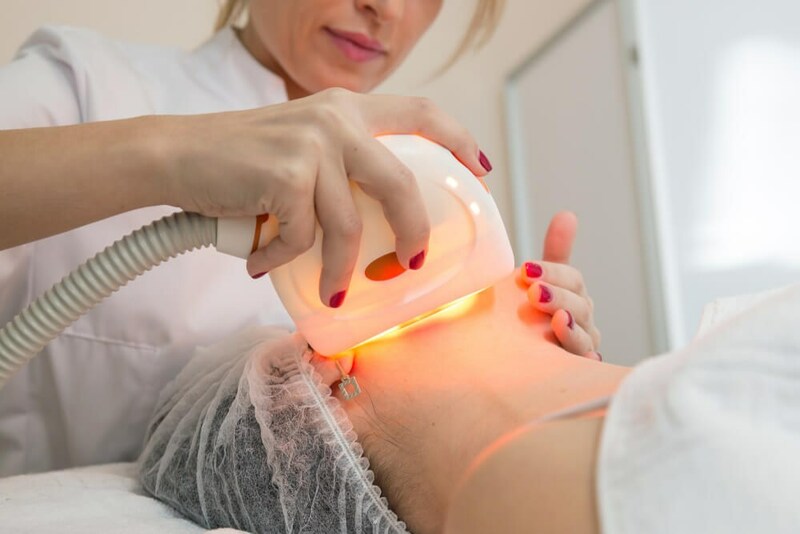 If you have sagging skin or want to prevent sagging, you can treat sagging skin with laser therapy. This works the same way as the previous point mentions. The laser stimulates collagen, which helps tighten your skin as well as preventing other aging symptoms. Another reason why the laser helps tighten your face is that it helps circulate blood. This will increase elastic production. Elastin is a protein found in the dermis of the skin. Elastic is what gives skin its strength; without elastin, your skin will sag. But this works best as a preventative or when you first show signs of sagging. If you think you need a procedure more intense, such as a facelift, you can consult with a doctor. Even if you're young, you likely don't have perfect skin. Discoloration, acne, scarring, redness, and other imperfections can happen to young people as well as old. Fortunately, the laser doesn't only target aging skin. A great reason to use the laser is treating hyperpigmentation. This is an uneven skin tone, usually caused by the sun. You'll form dark spots or freckles. This comes from melanin production when your skin is inflamed by UV rays. Hyperpigmentation is also caused by various other skin and health problems and is difficult to treat. How the laser treats pigmentation issues is by targeting the cells. The pigmentation issue is caused by increased melanin production which is the overproduction of the melanocyte cells. The laser will target these cells, making them inactive. With time, your hyperpigmentation will fade. This has been mentioned previously in this post, but it's important to elaborate on why the laser helps fade acne scars. The secret comes from collagen. Like wrinkles, collagen helps fill lines and makes skin plump. But why is it young people will have a wrinkle-free face but large acne scars? A pimple is daunting for the skin. It's similar to getting a big cut on your arm or leg. When your cut heals, it leaves a scar. The scar forms because there has been so much damage to that area, your skin can't produce enough collagen. Fortunately for younger people, your skin can produce enough collagen and your scars will inevitably fade. But it may take years, especially for severe acne scars. Fortunately, laser therapy can stimulate collagen in that specific area. This will help your acne scars heal faster, and most patients only need two or three treatments until their acne scars are almost eliminated. Are you one of those lucky people who never developed wrinkles or sagging skin? Even though you have the upper hand in the aging department, everyone will form an uneven or dull skin tone. Another main feature of collagen is the overall way it makes your skin look. When you meet someone with truly beautiful skin, their skin looks like it's glowing. That radiant and dewy look is the work of collagen. But as you age, collagen production decreases. Maybe you won't endure wrinkles or sagging skin, but dull skin tone is the one symptom most people see. Fortunately, the laser can handle this issue quickly. The treatment will stimulate enough collagen to give you that glowing complexion. The laser will also strengthen your skin so your skin keeps that beautiful glow. Will You Transform Your Skin With Laser Therapy? Your skin won't retain its beauty as you age. Maybe you're already experiencing aging symptoms now. Whether you want a treatment or a preventative, laser facial rejuvenation is your best option. Aging skin is a common issue which causes wrinkles and sagging. You can develop other issues, such as hyperpigmentation and acne scars, at any age. Even someone with the most perfect skin will develop a dull skin tone. Laser therapy can treat all of these skin ailments. If you want the laser facial treatment and are in Huntington, New York, make an appointment with us.